Four small-town losers stumble across an alien crash site containing an incredible battle suit. One round of bickering and a quick scuffle later, they each find themselves wearing a piece of the suit, which has genetically bound itself to them. Now they must work together as one to save humanity, and not kill each other in the process. 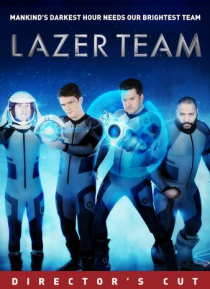 They may not be strong, smart, or talented...but they're Lazer… Team.